Is the NFL Really Stupid Enough to Hire ‘Gang Tattoo Experts’ to Examine Players? In the NFL, a racist idea gains surprising currency after the arrest of Aaron Hernandez. It’s difficult to express just how awful an idea this is on every conceivable level. Other than give confidence to Rush Limbaugh to repeat one of his favorite racist nuggets—“The NFL all too often looks like a game between the Bloods and Crips without any weapons”—hiring police to treat players like possible gang members would accomplish nothing. Let’s leave aside the attendant irony of the NFL with all its concussions, compromised medical professionals and sea of shattered bodies, being concerned about any culture of violence that surrounds their game. Hiring police tattoo “experts” rests on the assumption that NFL locker rooms are riddled with gangs. This assumption, in league that’s 70 percent African-American, is the very definition of racist. Why? Because there is no evidence whatsoever to support this. According to the FBI’s statistics, an NFL player is five times less likely to run afoul of the law than your typical 22- or 34-year-old. Such an inspection process would merely act as the collective criminalization and intimidation of people who are supposed to be your employees, and do—even in America—have rights on the job as workers. This is not a league of gang members. It is, however, a league that sells a highly commodified three-hour package of violence for a family audience. Yes, sometimes the violence spills off the field. But this has far less to do with the gangs in a player’s past than the weekly violence that defines their present. When there is off-the-field violence, it’s tragically far more likely to find expression in violence against women than in the highly sensationalized world of gangs. If the NFL wants to look at the roots of off-the-field violence and take the issue of violence against women seriously, then we should listen. If it wants to propagate the idea that tattoos signify violence and gangs, then we should reject this as stereotypical trash. 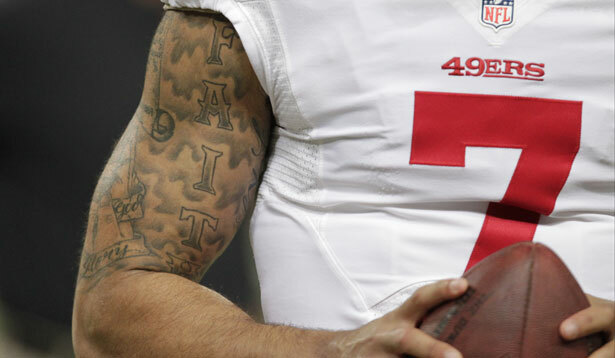 Should Roger Goodell and friends really want to know why so many players get tats, then they should listen to the words of perhaps the most tattooed player in the NFL, who also happens to have the league’s best-selling jersey: San Francisco 49ers quarterback Colin Kaepernick. To me, tattoos are a way of people being able to express themselves and have other people look at them and get a little insight into who they are, without ever even saying a word to them. All my tattoos, they’ve been thought out, thought over, been a work in progress for at least a year before I’ve got them. So I’m not walking into a tattoo shop, picking tattoos off a wall. It’s something that means something to me. It’s something that I believe in. The NFL is known as the “no-fun league” for a reason. Players get tattoos because in a league where you can get fined for having the wrong color of shoelaces, it’s the one way they can show their individuality and be more than a uniform and a helmet. The NFL doesn’t want us to know who’s under the helmet because you don’t want to market a league around players if your next play could be your last. Maybe if the NFL weren’t so callous about dehumanizing their product, players wouldn’t turn to ink to remind everyone that they are human. Dave Zirin explains why the NFL is a terrible place to work.